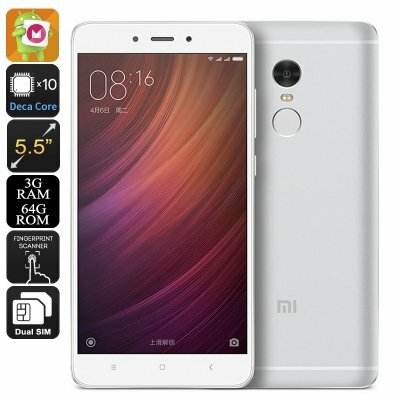 Successfully Added HK Warehouse Xiaomi Redmi Note 4 - Dual IMEI, 4G, Deca-Core CPU, 3GB RAM, 5.5 Inch Display, 1080P, 64GB ROM (White) to your Shopping Cart. Enjoy all the high-end specs the smartphone industry has to offer with this remarkably cheap budget Android Phone. The Xiaomi Redmi Note 4 is the latest budget-friendly smartphone launched by Xiaomi and holds some specs that one would normally only expect to find on a high-end device. Under its premium, full metal design lays some serious hardware with which this Android phone is guaranteed to enhance your user experience significantly. The Xiaomi Redmi Note 4 features a MIUI 8 Operating System that has been based on Android 6. With this OS the smartphone lets you enjoy the latest features the mobile industry has to offer. Holding Dual-SIMs and two IMEI numbers this Android smartphone provides you with the perfect platform to separate business and private life by using just one device. With its 4G connectivity this Chinese phone furthermore provides you with the fastest data transfer speeds out there, allowing you to be constantly connected to your friends and loved ones no matter where you’re headed. With its large 5.5 inch FHD display the Xiaomi Redmi Note 4 brings all media to life in the palm of your hand. Enjoy your favorite movies, series, and games in breathtaking 1080p resolution – this smartphone’s screen provides vivid colors resulting in an extraordinarily sharp and detailed viewing experience. An impressive 13MP camera additionally allows you to snap pictures of breathtaking quality that, thanks to the phone’s FHD display, can be enjoyed into their finest detail. Holding a massive 4100mAh battery this Xiaomi phone delivers enough juice for you to enjoy countless hours of entertainment or image editing without ever needing to worry about running out of power anytime soon. Powered by a Deca-Core MediaTek Heilio X20 processor that has been clocked at 2.1GHz, 3GB of RAM, and a powerful Mali-T880MP4 GPU, this Chinese smartphone is capable of handling the most demanding of tasks without dropping a single frame. Whether you enjoy a true cinematic experience by playing your favorite FHD movies, or are playing the latest and most demanding games, this Xiaomi smartphone handles it as a pro. Offering up to 64GB of internal memory and supporting a mesmerizing 128GB or external storage this Chinese smartphone allows you to download the latest media from the Play-Store without having to fear about available storage space. The Xiaomi Redmi Note 4 comes with a 12 months warranty, brought to you by the leader in Chinese Smartphones as well as wholesale electronic gadgets..